It has emerged that Christopher Myers, who resigned as a special advisor to William Hague following online rumours that he was having a gay affair with the minister took part in a taxpayer funded trip, before he had an official role with Mr Hague or the Conservative Party. Mr Myers joined Mr Hague and Chancellor George Osborne on a three day trip to the Chancellor, on the three-day Conservative trip to Afghanistan in January of this year, ahead of the general election. The flights and accommodation for the three men were paid for by the Ministry of Defence. It is usual for the Government to pay for the flights and accommodation for shadow ministers on trips to visit British troops, but some question why Mr Myers was there, given his lack of experience with foreign or defence affairs..
On the way back to the UK, Mr Myers and Mr Hague stayed in Bahrain for two days for meetings with the country’s foreign minister, Sheikh Khalid bin Ahmad Al Khalifah. In the House of Commons register of member’s interests, Mr Hague disclosed that he had paid for his flights but that the Bahrain government paid £1,115 to cover the cost of his hotel room. It is suggested that Mr Hague paid for a separate room for Mr Myers. 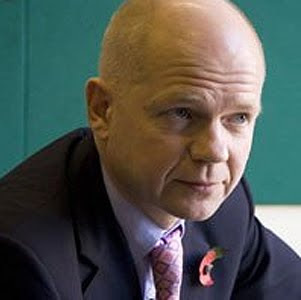 Last Wednesday, Mr Hague's special adviser Mr Myers resigned, citing the pressure of "untrue and malicious allegations". Tory grandees Lord Tebbit and John Redwood raised concerns about him sharing a hotel room with a young male aide and also questioned the extraordinarily personal statement he released on Wednesday. In it, Mr Hague, 49, detailed his wife Ffion's numerous miscarriages in an attempt to prove he is not gay. He also revealed that the couple had lost a pregnancy during the summer. Mrs Hague is understood to be a deeply private person, who has never granted interviews to the media. Mr Hague yesterday used Twitter to to thank his the public for their support over the saga. “Feel I must say a big thank you from Ffion and me for the huge public support, on twitter, in letters and in emails,” he tweeted..